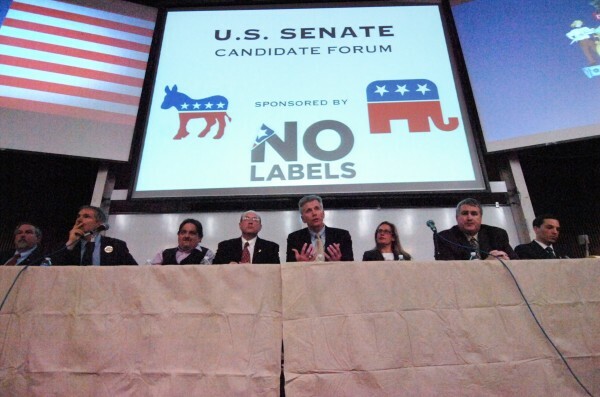 The first bipartisan forum in the U.S. Senate race was held at the University of Maine in Orono Wednesday evening. The candidates participating (from left to right) were Maine Attorney General William Schneider, State Rep. John Hinck, independent candidate Andrew Ian Dodge, former Maine Secretary of State Matthew Dunlap, current Maine Secretary of State Charlie Summers, State Senator Cynthia Dill, businessman Steve Woods, and home builder Benjamin Pollard. AUGUSTA, Maine — As the 13 candidates for U.S. Senate canvass the state ahead of the June 12 primary, campaign finances may not be on voters’ minds, but the topic certainly will be on candidates’ minds. Campaign finance reports for the 1st quarter of 2012 were required to be filed with the Federal Election Commission by April 15 and those reports offer an early glimpse of the role money could play. The first thing to note is that if a candidate was not in the race prior to Olympia Snowe’s Feb. 28 announcement that she would not seek reelection — and many were not — he or she had a short time to raise money. That could explain why Jon Hinck, a Democratic state representative from Portland, has raised more than $85,000 and former Secretary of State Matt Dunlap of Old Town has raised $82,000. Both have been in the race since last November. Cynthia Dill, a state senator from Cape Elizabeth, didn’t declare her candidacy until January. She has raised about $25,000 so far. The other Democratic candidate, Portland home builder Benjamin Pollard, has raised $9,000. On the Republican side, small-businessman Scott D’Amboise of Lisbon Falls has been in the race awhile, too. He planned to challenge Snowe in the primary and now has five opponents, all with impressive political resumes. Not surprisingly, D’Amboise is way out in front. He has raised $609,830 so far, although he has spent close to $490,000 of that total. Sam Pimm, campaign manager for D’Amboise, said he believes his candidate is in the best financial position. “We’re approaching 10,000 individual donors and these are people we can go back to between now and June,” he said Wednesday. Asked what the nearly $500,000 has been spent on, Pimm said “organization building.” The D’Amboise campaign has not purchased any traditional advertising. Despite the fact that many Republicans already had given to either Snowe or D’Amboise, other candidates were able to raise money in a short window of time. Rick Bennett of Norway, former state Senate president and a 1994 U.S. House candidate, stands out with $107,659 raised, more than twice any of his GOP primary opponents excluding D’Amboise. Secretary of State William Schneider of Durham is next with $40,095 raised, followed by current Secretary of State Charlie Summers of Scarborough with $21,280. State Sen. Debra Plowman raised $5,261 and spent $160 as of March 31, according to her FEC report, but she wasn’t worried about her financial status. “I’m focusing on the groundwork right now, but I expect to gather a bunch of small donations because those are the people who support me,” said Plowman, of Hampden. State treasurer and former gubernatorial candidate Bruce Poliquin of Georgetown is the only candidate on either side who has not filed a report with the FEC. Poliquin’s campaign spokesman Tyler Harber said Wednesday that according to guidelines set forth by the FEC, the campaign was not organized until April 5 and therefore was not required to file a first quarter report. Poliquin did host a campaign kickoff event in Warren in mid-March. The Alamo PAC, run by Republican National Committee chairman John Cornyn, gave $5,000 to every GOP Senate candidate except D’Amboise in early March. That included Poliquin and it means that if one person wrote a check for any amount to Poliquin’s campaign, it would have put him over the $5,000 threshold requiring registration with the FEC. Asked about the $5,000 donation from the Alamo PAC, Harber said the campaign didn’t receive that check until after April 1. Additionally, some donors who wanted to donate prior to April 1 were asked to hold their donations. “Since the campaign’s organization, we have experienced a significant and steady flow of donations that have fueled a strong ground operation and a statewide television advertisement,” Harber said, although he didn’t release a number. Poliquin also was the first candidate to purchase a television ad. Harber said the TV ad was produced in early April and the vendor was paid on April 9, after the deadline. Plowman did disclose the Alamo PAC donation on her 1st quarter campaign finance report. Independent Angus King of Brunswick, who many view as the front-runner, has raised $173,561, including a loan of $37,000, and had $142,321 in cash on hand. The two other independents in the race — Andrew Ian Dodge of Harpswell and Steve Woods of Falmouth — did not file reports. Not included in any of the campaign war chests is the $2.4 million in donations that still belong to Sen. Snowe. She could give that money back to donors or to other candidates, she could give directly to the Maine Republican Party, or she could do something else entirely with that money. Snowe’s campaign hinted this week that she plans to give at least some of her money to organizations that promote centrist views and consensus building in Congress. Any formal decision will have to wait until Snowe completes her term. Former U.S. Sen. George Mitchell, a Democrat, famously set up a scholarship program with $1 million in unspent campaign funds when he chose not to seek reelection in 1994. As of 2011, more than 1,900 Maine students have been named as Mitchell Scholars and a total of more than $8.5 million has been committed to these students. So what do the early numbers mean? Mark Brewer, a political scientist at the University of Maine, said they are hard to read at this point. “On the Republican side, I think there are more candidates and many of them are in a good position to raise money,” he said. Brewer also said King’s presence in the race could be inhibiting donations to both sides, but particularly Democratic candidates. “I think, without him, there could be a lot more money flowing,” he said. One explanation for the relatively slow stream of dollars is the fact that the field of candidates wasn’t settled until mid-March. Democrats were reluctant to give to any candidate who might be seen as a “sacrificial lamb” to Snowe, who until late February was presumed as the likely GOP candidate. Conversely, many Republicans either gave their money to Snowe or, to a lesser degree, D’Amboise. And with six candidates, there is only so much money to go around. Brewer predicted that money would become a bigger factor once the field is set. If the Republicans or Democrats have candidates who can seriously challenge King, the national parties will be much more willing to send money to Maine where advertising is cheap, he said. But that doesn’t mean candidates shouldn’t worry about money now.